A 56-year-old male, chronic smoker, diabetic, and hypertensive of 15-year duration was admitted with biventricular failure. His ECG revealed poor R-wave progression in anterior chest leads and echocardiogram was suggestive of global left ventricular (LV) hypokinesia, depressed LV systolic function (LVEF = 30%), and moderate pulmonary hypertension. His biochemical parameters were within normal limits. The patient was given aggressive decongestive therapy and showed marked improvement. Before discharge, he was subjected to coronary angiography to rule out any ischemic etiology for LV dysfunction. 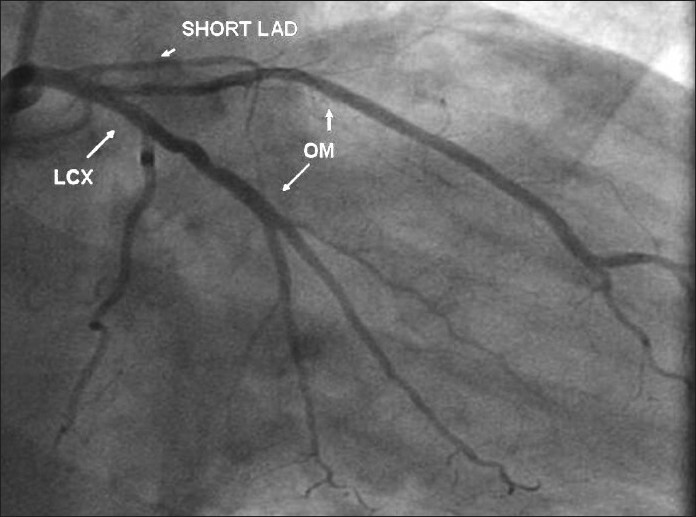 At CAG, there was no obstructive coronary artery disease; however, the patient had incidental detection of a congenital coronary anomaly in the form of dual LAD origin. The left anterior descending (LAD) artery arising from the left sinus was short and gave rise to septal branches [Figure 1] and [Figure 2]. The circumflex (LCX) and right coronary artery (RCA) were normal. 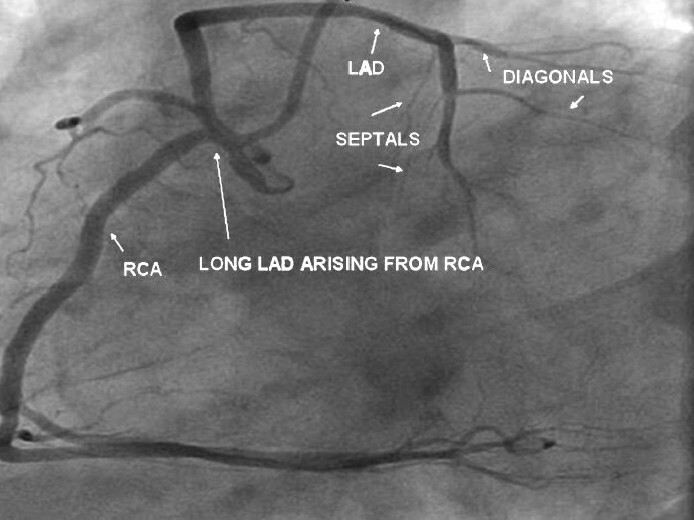 A second LAD was seen arising from the proximal RCA. This LAD was long and septal and diagonal branches were also seen arising from this long anomalously arising LAD [Figure 3]. This was consistent with the type IV variety of dual LAD as per the Spinaldo-Franco Classification (see discussion), a rare entity. Type IV: High in the AIVS, a very short vessel is formed by the LAD proper and the short LAD. From this vessel, the major septal perforators, as well as the diagonal branches, originate. The long LAD is unusual in its origin, arising from the RCA. 1. Yamanaka O. Hobbs RE. Coronary artery anomalies in 126,595 patients undergoing coronary arteriography. Cathet Cardiovasc Diagn 1990;21:28-40. 2. 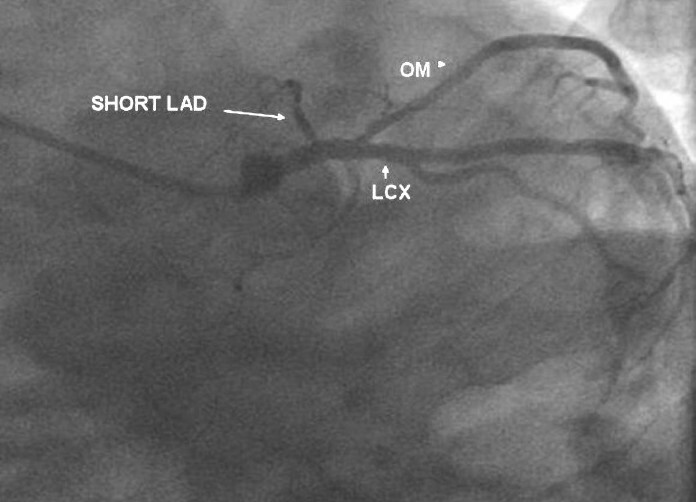 Morettin L. Coronary arteriography: uncommon observations. Radiol Clin North Am 1976;14:189-208. 3. Spinaldo-Franco H, Grose R, Solomon N. Dual left anterior descending artery: angiographic description of important variants and surgical implications. Am Heart J 1983;105:445-8. 4. Sajja LR, Farooqi A, Shaik MS, Yarlagadda RB, Baruah DK, Pothineni RB. Dual Left Anterior Descending Artery. Tex Heart Inst J 2000;27:292-6. 5. Moreno-Martinez FL, Vega LF, Fleites HA, Ibargollin R, Gonzalez R, Lopez OJ. Dual left anterior descending coronary artery. Internet J Thorac Cardiovasc Surg 2005. Vol. 7.